In France, on the Eve of Epiphany, which falls on the 6th of January, twelve days after Christmas, people eat the galette des Rois “the king’s cake”, a puff pastry with almond cream, but with a trinket (usually a porcelain figurine of a king) or a bean (la fève) hidden inside. The person who gets the piece of cake with the trinket or the bean becomes "king" for a day. Other popular traditions, include having the youngest member of the gathering sit under the table and designate to whom each piece of cake should be served. The cake is eaten in celebration of the arrival of the three kings who have traveled from afar with gifts for the newborn baby. 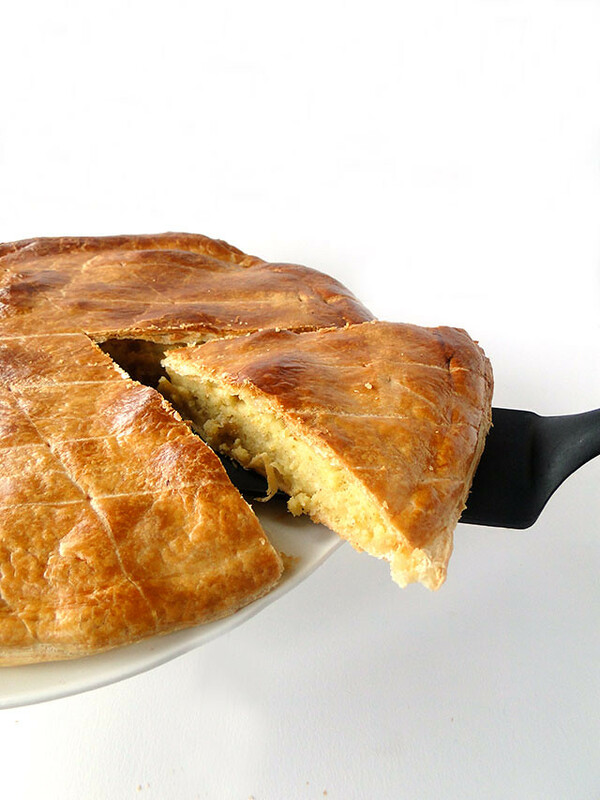 If you look around the patisseries and supermarkets in France at the beginning of January, you simply can’t miss out "la galette des rois". They're everywhere, and they're not only filled with the traditional frangipane, but with chocolate or fruit as well. Last year, I bought one but this year, I decided to make my own. Of course I bought the puff pastry but you can make your own if you like. Bring the milk to a boil, add the vanilla bean and its seeds, add half the sugar. Remove from heat and let it infuse 15 mn. In a bowl, whisk the egg yolks with the remaining sugar until light. Add in the corn flour. Mix to combine. Remove the vanilla bean (sifting) and slowly pour the hot milk into the yolk mixture, stirring all the time. When about half of the milk has been added, place all the yolk mixture into the saucepan over medium heat. Using a whisk, mix the pastry cream as it heats, making sure to reach all of the corners of the pan when you stir. Bring the mixture to a boil. Let boil for about 1 minute, stirring constantly. The mixture will be thick. Cover the cream with a plastic wrap (in direct contact) to stop a skin from forming. Once cool, refrigerate. Use only 150 gr of this cream; save the rest for some other dessert. Whisk the butter with the sugar, then add the almond flour, the pistachio paste and the eggs one by one whisking after each addition. Add the rhum, the pastry cream and the corn flour and mix. On a slightly floured surface, roll the puff pastry with a rolling pin, cut 2 circles (app. 28 cm diameter) out of the puff pastry. Put one of them on a baking sheet covered with a parchment paper. Prepare the egg wash, but beating an egg with 1 tbsp of water, a pinch of salt and a pinch of sugar. Brush one inch around the edge of the circle with the egg wash. Spread the frangipane cream on the center, put the "feve" (bean or figurine), and place the second circle on top matching the edges of the circles. Press all around the edges to stick them together. Refrigerate for 1 hour. Lightly brush the top of the gallette with the egg wash. Use the back of a knife to make a criss cross pattern in the egg wash. Finally, prick several small slits in the top to vent steam while baking. Bake 20 mn at 200°C, then lower to 180°C, for another 25 mn. Portez le lait à ébullition, avec la demi gousse de vanille et ses petits grains, et la moitié du sucre, puis laissez infuser hors feu. Pendant ce temps, dans un bol, battez les jaunes d'oeufs avec le sucre jusqu’à ce que le mélange blanchisse, ajoutez la maïzena, puis versez petit à petit le lait chaud et enfin remettez le tout dans la casserole à feu doux, et portez à ébullition sans cesser de fouetter, et voili-voilà, une magnifique crème pâtissière...que vous laissez refroidir dans un bol avec un film alimentaire collé à la surface pour éviter que cela ne fasse une croûte. Faites blanchir le beurre mou avec le sucre puis ajoutez les amandes en poudre et la pâte de pistaches et enfin les oeufs un par un, le rhum la crème pâtissière et la maïzena. Etalez la pâte feuilletée à l’aide de votre rouleau, de façon à obtenir 2 cercles de 28 cm (à peu près), mettez un sur une plaque recouverte d'un papier sulfurisé, et vous déposé la préparation à 4 cm des bords (pour que ça ne déborde pas à la cuisson). Préparez la dorure, battez un oeuf avec une cuill à soupe d'eau une pincée de sucre et une pincée de sel, et passez un coup de cette dorure sur le bord. Mettez votre galette au frigidaire pour une heure avant de la faire cuire. Enfournez la galette 45 mn mais il vous faudra baisser le four à 180ºC au bout de 20 mn. Love that last picture, it highlights the lovely crisscross pattern on top of the galette so nicely. Sadly I didn't make one this year, but the last time I made it, I had put chocolate chunks in the frangipane and it worked out well. I have never tried it with pistachio paste in the filling before, maybe next time! I studied this galette in French class, haha. A thing of beauty, so polished and well-crafted. I know you said on occasion you can find fruit *inside*, but how blasphemous would it be to drizzle a fruit reduction or thinned out jam over top? I imagine a blackberry or black cherry jam drizzle over the top being killer. This looks delightful! I love the almond cream. In Greek tradition we make a Vassilopita for New Year's Day but it is only a dense, orange scented butter cake with a coin hidden inside, quite similar in tradition. 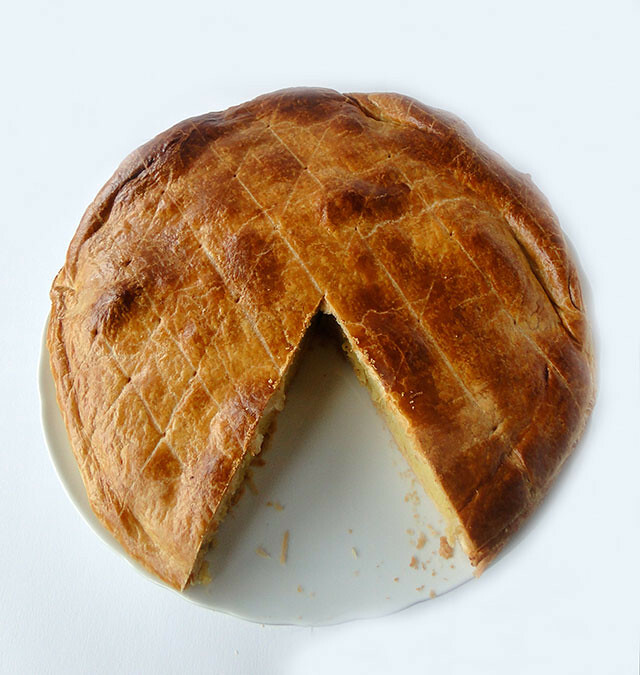 J'adore la galette des rois; mais comme je suis toujours déçue par celles en vente ici je m'abstiens; mais la faire. c;est une excellente idée. J'aime la pâte a pistaches dans la tienne. Superbe. Nice work. I like the hatching on top. I see it can be used as a cutting guide. 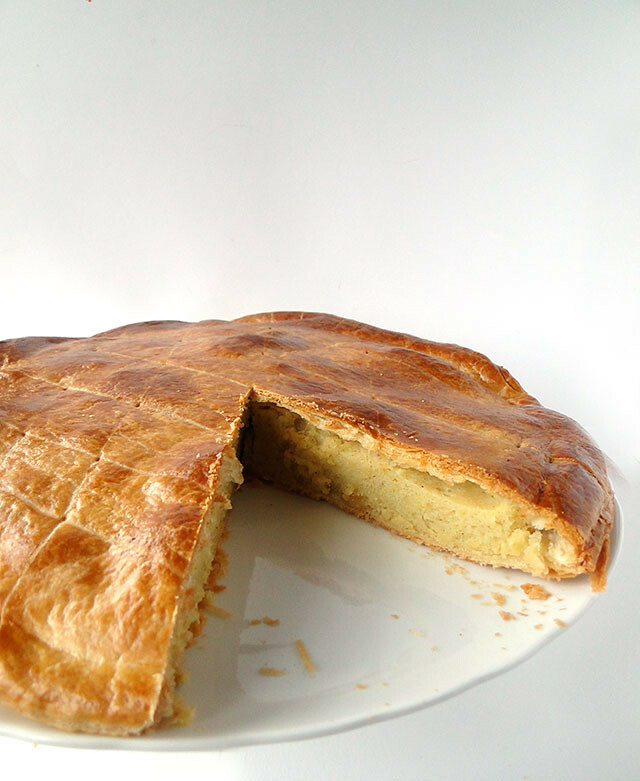 Merci beaucoup Cherine et ta galette est sublime....Un régal pour les yeux !!! Gorgeous photos. I was just thinking about this cake. I'm not a very good baker so I plan on picking one up at the local French patisserie (shh). Yours looks amazing. Bonne annee!! Between you and Cristina (BA to Paris), I'm learning about French tradition. Your galette looks delicious, too. I love anything made with almond. Happy New Year! Yummy!! We have to start exporting these galettes!!! What do you think? This sounds so delicious, i've never had one but i've just learned about it on another blog too, and would love to try! I have been meaning to make something like this...it looks just so beautiful. In fact, this time last year we shared a mini one. Beautiful! I have never tasted this but you made me want to try. What a beautiful cake and a lovely tradition. I would love this puff pastry creation filled with almond cream. I saw King's Cakes for sale in Whole Foods this week, but how fun to make your own instead! Great idea, and congrats on the top 9! quelle jolie galette, ça fait plaisir de la voir à l'honneur sur foodbuzz, bravo !! Jolie galette! Je vais en manger une ce soir! Bravo! This looks sensational! My husband loves almonds and this would make him really happy! We were in France (as usual) for Christmas and New Year and I bought one just like this and brought it back to the UK just in time for the 6th. Friends also invited us to their house in France where we had the brioche one with fruit and rum - different to the one you made, but delicious all the same. Well, Bonne Annee and Congratulations on making the top 9. All the best, KG. Oh Cherine, I love the American version of king's cake, so I KNOW this elegant cake would be a new favorite!